I love working with grains. They are not at all showy in the field; having evolved away from having the fancy flower parts that in other plants help attract pollinators, they instead rely on wind for pollination, or are self-pollinating. And they seldom make the exciting part of a meal; rather, they usually serve as a backdrop to and support of whatever protein or vegetable is the chef’s showcase. Yet there they are, ever present in our agricultural rotations and diets, workhorses without which the rest of the system would be far more difficult. And they don’t mind, because they know deep down in their grainy selves how important they are. They are central to different cultures’ food traditions: the Middle East’s wheat, Europe’s oats and barley, Asia’s rice, South America’s corn, Africa’s teff and millet and sorghum. Because they store well, they provide food through the non-growing parts of they year. Their fiber helps support the gut bacteria that are so important to our health. And their extensive root systems help build our agricultural soils. However – and I guess this is the part I really like – because of their diminutive size and growth characteristics there is much more to their harvest and use than there is to, say, those of an apple. Hand picking individual grains is not practical, and with any harvest method more advanced than that comes the need to separate the grains from chaff and other plant trash. The need for bulk picking and separation brings forward issues of efficiency and scale, and we have been exploring these as we move into more grain production. To harvest grains, you need to cut the plants’ stems; free the seeds – the grains – from the seed heads (called threshing); then separate the grains from the rest of the material (called winnowing). These three steps can be done at multiple scales, from a single person using hand tools up to a commercial-level machine that does all three at once (and is, appropriately enough, called a combine). Additionally, some grains have hulls that need to be removed, which adds another level of complexity. 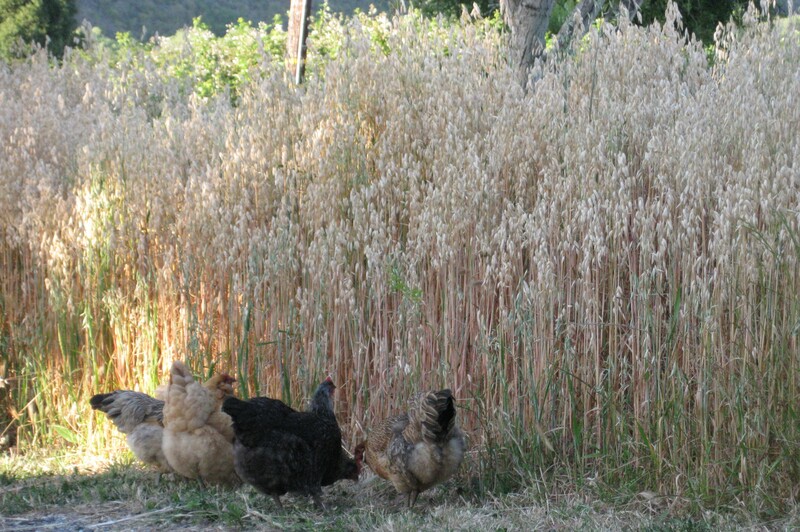 Our first grain crop was oats. We planted a hulless (and somewhat bland) variety, since we had no way of dehulling grains at the time. 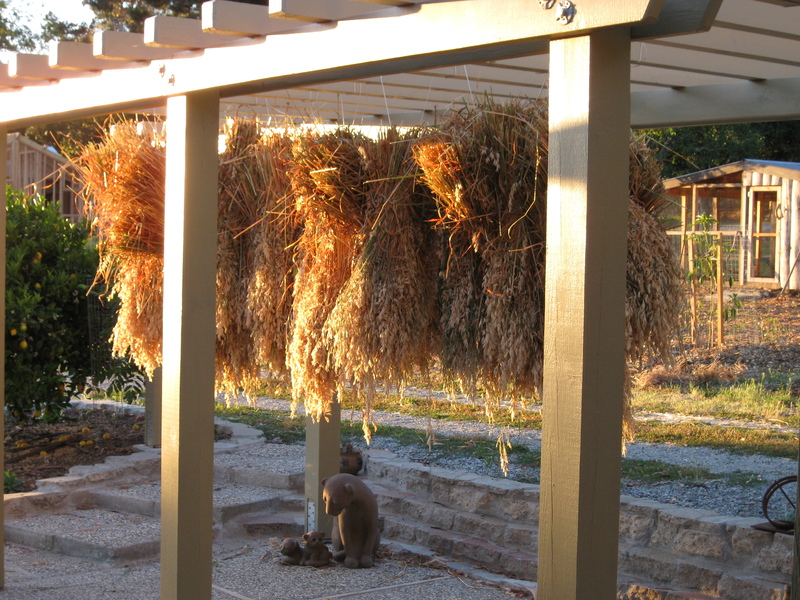 We harvested the crop with sickles, tied it in bundles, and let it hang to dry on our patio. Once it was dry we had to figure out how to thresh it. We started by grabbing handfuls by the stalks and beating the heads against a tarp on the ground; when that didn’t work , we sandwiched the plants between two layers of tarp and did a little shuffling dance on top, eventually doing the dance directly on the plants for more friction. I was a bit concerned with the cleanliness of this process – one does not usually step on one’s food – but there didn’t seem to be an option. I went through the logic: since the grains would be cooked prior to eating, any pathogens on our shoes would be killed; however, other things that hang out on shoes – toxins, rocks – would remain. I decided that the former would be in low enough concentrations that I wouldn’t worry about them, and that the latter would have to be carefully screened out. Once the grains were threshed we grabbed the corners of the tarp and shook it, causing the grain to work its way to the bottom. 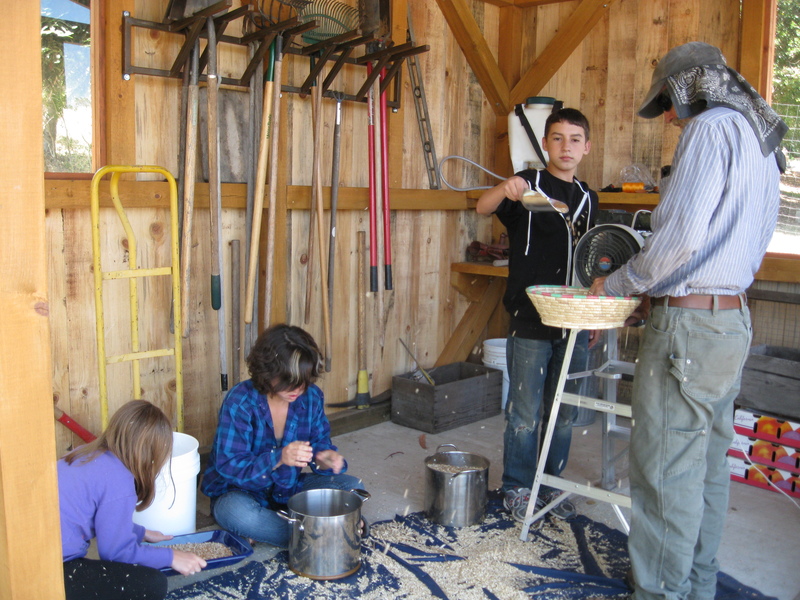 We scooped off the straw, then winnowed the grain with a fan, picking through it by hand to remove the remaining chaff. The process was slow and inefficient, and we were lucky to have had several young relatives visiting who were happy to help with it. Even after painstakingly hand sorting the grain, there was still quite a bit of chaff that remained. We got rid of this as we used the oats, by floating it off: we placed about a quart at a time of oats in a deep bowl and added enough water that the chaff floated above the grain, which stayed at the bottom of the bowl. We could then easily scoop the chaff off the top of the water, drain the grains in a sieve, then dry them out in an oven at low heat. Once they were dry we picked through them once more to get any remaining grains that had hulls on them. The hulled grains and chaff we fed to the chickens. We were excited to have our own home-grown oats, and it was really satisfying to be able to flake them as needed for our oatmeal in the morning and fruit crisps in the evening. However, we immediately started looking for ways to increase the efficiency of harvest, which is what I’ll talk about in the next post. This entry was posted in grain processing, grain production and tagged grain production, home-grown feed. Bookmark the permalink.